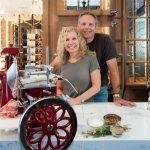 We created the Journeyman Meat Guild to deliver limited edition batches of our artisanal salumi to those who cherish it most. 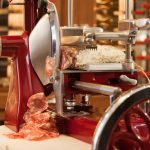 We hope that you will share our handcrafted salumi with your friends and family. Our February shipment is SOLD OUT so JOIN US!! today and your first shipment will be in May. Quarterly salumi shipments of two limited-edition salumi complete with serving and wine pairing suggestions. Shipments are February, May, September & November. Membership is $27 per shipment and billed with each quarterly shipment. A small fee of $8 applies for shipping & handling. Members do have the option of picking up in our salumeria in Healdsburg @ 404 Center Street. Questions or sign up with a team member, call our Club Office 707/433-5830. To sign up, just follow this link. If you have an existing account with our Journeyman/San Lorenzo wines, enter your login information. New users can create an account by following the “create a new account” link. The fine fine print: *Club membership includes a minimum of 2 shipments. *Our Salumi is slowly cured so, should, for some dreadful reason, you need to cancel your membership, we do need a two month notice prior to the next shipping. *Should there be an issue with your order, refunds or replacements are available within two weeks of shipping.